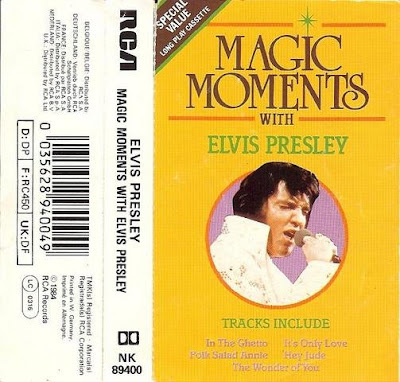 About 25 years ago I bought a cassette called Magic Moments With Elvis Presley. This release wasn't available on vinyl or in the then new CD format, only as a "special value long play cassette." As you can clearly see, this was no ordinary compilation, and why these particular songs were picked is anybodies guess. But they worked well together and made for a smooth ride and an easy listening cassette. Even "Your Time Hasn't Come Yet Baby" somehow managed to fit in nicely. I used to play Magic Moments With Elvis Presley a lot in the years that followed, but then lost it somehow and forgot all about it. Until now. On one of my frequent visits to Tradera (the Swedish equivalent of Ebay) I recently spotted a copy of this cassette only package and placed a bid. Apparently no one else realized what a great find this was as I was the only bidder. The price I had to pay was ridiculously low, and a couple of days later Magic Moments With Elvis Presley arrived with the mail. This may sound stupid, but it felt good opening the envelope and seeing that old cassette again. I inserted it into my stereo, pressed play and got myself reacquainted with a release I bought the first time 25 years ago. And you know what? It was still good value for money! PS: I bet you didn't know Pet Shop Boys recorded their version of "Always On My Mind" thanks to the cassette Magic Moments With Elvis Presley? love your blog. I actually have the very same cassette in my collection & bought it for the same reason, the unusual selection & the price ! I'm originally from the UK & bought it our local Woolworth's (or Woolies as we used to call it). Regarding the cover, in those days I used to cut pics from magazines & insert them in my personal cassettes (of which there are many), I did the same with this one ! Also, I remember that just before the Pet Shop Boys released their version of 'Always On My Mind' they had sang it on a 10th anniversary tribute show to Elvis. It had surprised me when they appeared on that show since I didn't think they were Elvis fans. Later, when their single came out (I think around Xmas), I remember thinking how canny they were to get the free publicity via that tribute show.